JANE: Last time, I pointed out that there are many varieties of folk music and suggested that we might take a closer look. You commented that one of the great things about folk was that it wasn’t limited to traditional pieces, but was open to new material as well. Afterwards, I was thinking how this extended further – that even traditional pieces were open to reinterpretation. ALAN: You really are a secret folkie, aren’t you? That happens a lot, and it’s one of the reasons why the music stays so alive and relevant. JANE: I’m discovering that I know a lot more about folk than I realized. That’s for sure! One song that immediately came to mind was “The Cherry Tree Carol.” This is a lovely piece often included on Christmas albums, although it really isn’t a Christmas song. It tells the tale of how Mary told Joseph she was pregnant – and how Joseph didn’t take this announcement well at all. ALAN: No – that one seems to have passed me by. Do go on! JANE: What’s interesting is how different groups have rewritten the payoff. The basics are the same. Mary makes her announcement. Joseph is not happy, Baby Jesus speaks “from his mother’s womb” asking the cherry tree to bow down so his pregnant mother can pick cherries. 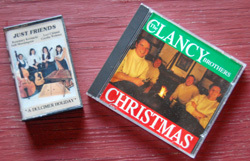 The Clancy Brothers version is much harder on Joseph: “Mary shall have cherries/ and Joseph shall have none.” Jim found this very unfair to poor Joseph, so I pulled out the other version for him. He was relieved to learn that the interpretation wasn’t absolute. ALAN: That kind of thing is very common. There really isn’t any such thing as a definitive version of many of the old songs. James Francis Child (in the nineteenth century) and Ralph Vaughan Williams (in the twentieth century) compiled huge collections of traditional material and again and again and again they set down variant lyrics for the same song. JANE: “Ralph” = “Rafe”? You Brits are definitely pronunciation challenged. Any other thoughts on how folk music stays “alive” rather than being trapped in tradition? ALAN: Absolutely! Not only do the lyrics vary, so do the musical styles. On the one hand, you might find the much derided Morris Dancing music, on the other hand something vaguely Elizabethan involving dulcimers and lutes, and on the gripping hand something with pounding rock rhythms. All can live happily together, and indeed all may well be in the repertoire of a single group of people. JANE: I was introduced to Morris Dancing in Terry Pratchett novels. I’m not sure it made it to the U.S., although I’d be happy to be informed otherwise. Maybe re-creation groups have kept it going here. That would be very good, since making sure the sun will rise should not be left to any one population! ALAN: Absolutely! Good backups are vital. JANE: Well, if he was using his willy, that would explain why folk music gradually died out on the pop music scene. That’s a joke. I know folk remains a vital, multi-cultural musical force. In fact, it’s so varied that it’s unfair to lump all forms of folk music together. For example, my immediate reaction if someone says “Do you like folk music?” is to wince, because I’m thinking of poorly done harmonies, badly-mixed albums where banjo, harmonica, and jangling tambourines overwhelm the gentler instruments, while school children shrill with atonal enthusiasm. This is like judging SF after reading a handful of poorly written pulp pieces. ALAN: That’s a perfect analogy. You’re exactly right. JANE: I love dulcimers… They’re magical. Harps are great, too. Good acoustic guitar, flute… All these make my heart soar. And, like you, I have a weakness for songs that tell stories. Any suggestions as to groups I might like? ALAN: Oh, I could make a huge list! But before I do, you need to understand that, in the UK anyway, everybody knows everybody else and the groups change personnel between themselves all the time. The cover of my LP The History of Fairport Convention is a family tree that attempts to define the coming and going of various personnel among various groups during the years 1967 to 1972. It’s so bewilderingly complex that at several points the diagram simply gives up. So you must realise that the Steeleye Span who made the album Please to See the King in 1971 is a very different Steeleye Span from the group that made the album Parcel of Rogues in 1973. Nevertheless, there is a degree of stylistic continuity. Steeleye Span have always concentrated largely on traditional material. Renaissance, on the other hand, while obviously influenced by the folk tradition, never performed any traditional material at all. The lyrics of many of their songs were written by a poet who rejoiced in the magnificent name Betty Thatcher-Newsinger (about whom I know nothing). The Renaissance members wrote their own music to go with Betty’s lyrics. Pentangle straddled those two extremes with an eclectic mix of traditional and modern material. And, more recently, I’ve fallen in love with a British group, Mumford and Sons. And an American group, The Decemberists. Both of them sing original material that is obviously very influenced by the folk tradition. JANE: Thanks for the recommendations. I’ve heard of Steeleye Span and Renaissance. Jim might even have some of their albums. Anyone else want to offer recommendations? This entry was posted on November 13, 2014 at 1:00 am and is filed under Thursday Tangents. You can follow any responses to this entry through the RSS 2.0 feed. You can leave a response, or trackback from your own site. Over a decade ago, I saw morris dancing at the Madison, WI farmer’s market. It’s alive and well out there, which helps to keep the planet spinning, if only out of sheer consternation. Oh… You’ve made me laugh out loud. “If only out of sheer consternation.” Great line! I like a fair amount of Cordelia’s Dad, which is mostly folk/punk rock. Tim Eriksen’s solo stuff is good too, particularly ‘The Soul of the January Hills’, which is solidly acapella traditional folk songs. Cordelia’s Dad and various friends did an excellent shape note album under the name ‘Northhampton Harmony – The Hooke’s Regular Sing’. One more mention: ‘Old Regular Baptists: Lined-Out Hymnody from Southeastern Kentucky’. It won’t be to everybody’s taste, but I love it. And blending folk and punk? Wow! I always had a great laugh over Mary gathering cherries while Joseph just sort of stands there, maybe flapping his hands uselessly. Nice to know from various sources that the rising sun is safely protected in the New World as well as the old. Santa Lucia would be “holy light.” Is Little Devil Doubt someone who doubts the sun will rise? Isn’t Santa Lucia part of the Scandinavian Christmas tradition where the girls wear the white dresses and the green wreaths and candles on their heads? Chad – yes. Like I said, it was a very blended set of traditions! Jane – Little Devil Doubt actually serves mostly to beg the crowd for money at the end of the play! I’ve noticed that this discussion almost exclusively concerns recorded music, rather than live. In some ways, I feel that live music is a completely different art form than recorded music, and that this especially true in folk music. A live folk music performance is about the audience interacting with the performers. It’s an immediate, emotional, collective response. It’s about singing along, or dancing, or getting smiles or laughs, or clapping along. If the performer messes up, oh well, just smile and keep going (that applies to both performer and audience). The music itself can adapt and change–playing faster, adding an extra chorus, improvising a little riff, or throwing a tag on the end, depending on the audience-performer interaction. Recording the music changes that dynamic completely. The recorded version is fixed and static. The performer can’t feed off the audience response. Modern recording technology also allows so, so much manipulation of the sound. This can be good or bad, depending on how or why it’s being manipulated. But generally, the end result is much more formal and polished and intellectual and very, very different than the same artist doing a live performance of the same piece. I’ve been to live performances that were just absolutely wonderful–but I can’t stand listening to a recording (or watch a YouTube video) of exactly the same performance. I’ve also been to live performances of groups I’d heard only on recordings previously, and been very unimpressed. I loved seeing Bill Staines live in a small venue, but I don’t like the production values of most his albums, for instance. I think the best balance between live and recorded appeal that I’ve come across is Heidi Muller and Bob Webb. So if you’re talking about folk music, there’s a huge difference between live and recorded. A local amateur band may sound horrible in a recording, but may put on an awesome, fun show. A big name artist focused on putting out polished albums may have a pretty dull live show. Or, they might have an awesome live show that sounds completely different from their albums. As an amateur musician myself, I’m happy to grab an instrument and jump on a stage. I really don’t like trying to do recordings (maybe if I could afford to pay someone to record me instead of trying to do it all myself…). I’ve recently realized that if I want to record something to share, such as with out of state grandparents, I do better if I have a live audience there while I’m recording, instead of just sitting alone in my living room with my digital recorder. Anyway, the gist of all of this is that I think decent live music can be a better experience than excellent recorded music–but remember that they’re different things, and that folk music in particular is about immediacy and audience/performer interaction, with a strong amateur tradition. This is a very good point to consider. I wonder if the reason the discussion was mainly about recorded folk music (at least this week–didn’t Alan talk last week about chasing around the countryside to hear performances?) is that hearing live music takes a lot of both luck and effort–unless of course we produce it ourselves. Recordings we can listen to anytime. This unfortunately has undermined the impulse to make our own music. On the other hand, recorded folk music is for most of us the only way to learn the old songs. We haven’t got grandparents sitting on the porch of an evening teaching them to us, and written music (for those who can read it, which I’m not so good at) will only take you so far. I myself am not so good at sitting in an audience. I tend to get twitchy. I want to be part of the music, not just listen. But what you are saying about doing better with an audience makes sense. I love singing to myself, sure, but singing to others is better. Singing _with_ others, hearing my own voice crossing & twining with theirs, can take me to what feels like the heart of the music. Good points both of you… I know that in my case, the focus here and elsewhere, on recorded music is that I am not thrilled by loud noise and that’s what most venues provide. Some of my happiest music memories (some of which I’ll be mentioning in a few weeks) involve small,intimate venues.